One of my favorite types of movies are crime movies or gangster movies. Anything like that, really, is worth checking out. There’s just something fascinating about the lifestyle, and it gets even more fascinating when the story is set in a time and a place that really adds character to the situations the characters find themselves in. 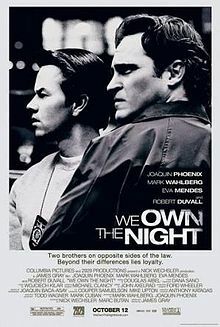 James Gray’s film We Own the Night takes place in the late 1980s, which was a time in New York City when crime was at an all time high. This caused the rise of the NYPD’s Street Crime Unit, whose tagline was the title of this film. All this history and material should make this film an instant classic, but it unfortunately fell under the radar for some reasons that became very obvious as I was watching. Bobby Green (Joaquin Phoenix) is a manager of a popular club that is unfortunately a host to a nefarious criminal named Nezhinski (Alex Veadov). Despite this, Bobby is living the life he loves at the club with his girlfriend, Amada (Eva Mendes). What the club owners and employees don’t know, is that Bobby’s father, Burt (Robert Duvall), is the chief of police and his brother, Joseph (Mark Wahlberg), is a highly respected officer of the Street Crimes Unit. These separate lives intersect when Burt and Joseph ask Bobby if he is willing to inform on Nezhinski’s activities to them, but after Bobby declines and there’s a raid on his club, Nezhinski starts taking matters into his own hands and attacking police. As Bobby tries to resume life by any means, the gangsters operating out of his club start getting closer and closer to learning who Bobby and his family is which forces the police to start working faster and making rasher decisions. There’s so much that material to work with to make this an epic crime film of this time, yet it falls very short of that epic scope it should have had. The first glaring issue is the uneven tone and pacing of the story. During the first half of the movie, Bobby feels very disconnected from everyone and everything, including his family and his club. Part of the reason why is because we’re just thrown right into his life without getting any history of the characters or why they behave like they do. Some set up would have really gone a long way. Once we get around halfway through the movie, things really start focusing up and the story really feels like it gets kicked off. There’s just so much jammed into the first half without any back story given, while the second half is the payoff from all of that which is done in a much more concise and focused way. It feels like this could have been a 3 hour movie instead of a 2 hour one. We Own the Night has an excellent cast, which is another reason that drew me to this movie. Joaquin Phoenix is one of the most powerful actors working today and he gets some really excellent scenes to show just how talented he is. Eva Mendes also gives one of her better performances, and Robert Duvall gives a very subtle yet sincere performance as Bobby and Joseph’s father. Now we come to Mark Wahlberg. I’d love to say he did great in this film since he is a fine actor, but he doesn’t get to do a damn thing. For a huge portion of the movie, he isn’t even in it, but when he is, he’s either berating his brother or sitting around in his office. When he finally does get to go out into the field, he still doesn’t do anything. I haven’t seen a character wasted like this in a really long time, and no other such egregious instances comes to mind in recent memory. What really saves this movie from falling into the deepest pits of mediocrity are some scenes that show what James Gray is really capable of. One scene towards the beginning of the movie shows one of the most realistic depictions of street violence I’ve seen in a movie. It’s shocking and gut wrenching in its realism. Speaking of gut wrenching, there’s a car chase later on that is so un-cinematic and all the more intense for it. There’s minimal music in this scene and most of the action takes place inside one car with the the other action and sound just what can be seen and heard through the windows and the torrential rain. There’s a handful of other great scenes as well that really bolster this movie up higher. I wanted to like We Own the Night a lot more than I did. It has all the makings of being a great movie, but the plot and tone can be so uneven and a potentially important and interesting character is completely wasted. While some of the pieces don’t fit very well, there are still some really memorable scenes and very good performances by the actors whose characters actually get to do some stuff. I was looking for a movie that was going to hopefully sit with the greats in the crime subgenre, but what I got was a movie that was a little frustrating and failed at reaching its true potential.